Bhutan is located east of Nepal, south of Tibet and north of India. Two major river systems have carved deep gorges and created vastly untouched natural environments. Rivers are fed by monsoons and the snow run-off of the Himalayas. Thanks to the national religion of Vajrayana Buddhism, which honors nature and the sanctity of life, Bhutan's forests and wildlife remain pristine and intact. The country boasts a 64% forest cover. Paddling the whitewater of Bhutan will offer a unique view of the country rarely even seen by the Bhutanese. October is the perfect time of year to see this country by raft. The summer rainy season has ended leaving rivers high enough to run, and the cold Himalayan winter has yet to descend into the valleys. A blend of culture and mild adventures. In Bhutan, we have not only monasteries and Dzongs to show our visitors but some beautiful rivers with immense rafting possibilities. In this trip you will visit the highlights of Thimpu, Paro and Punakha and have some fun with the gentle rapids (2, 3+) of Pho Chu. If you want a bit harder, Mo Chu challenges with its grade 4 rapids. For rafting purpose, March till May and September to November are the ideal months. Rafting is not so popular in Bhutan. Some of our clients prefer to embark on this adventurous sport as a part of their cultural tour. 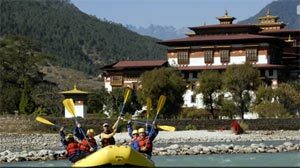 Water sports in Bhutan is at its infancy stage, we combine rafting as a part of the tour package so that our clients can feel the taste of adventure. The cost of hiring a raft/kayak is not included in our tour cost, so, you will have to pay extra for hiring a raft/kayak. Rafting is done in most of the rivers of Bhutan. The most popular one is Pho chu and Mo chu in Punakha. The most rivers used for rafting are class iii and class iv rapids. Usually we organise rafting/kayaking for a day unless the clients want to extend it for several days. White River Rafting in Bhutan is a recent tourist Adventure sport initated by the Department of Tourism. During the recent survey of rivers in Bhutan, the following rivers are found to be suited for River Rafting and Kayaking.